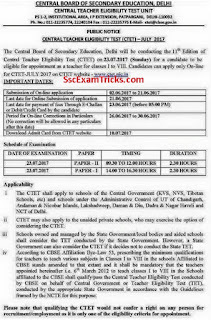 CTET 2018 Notification, Admit Card CTET TGT PRT Hall Ticket Exam Date - CTET July 2018 Notification – Download CTET July 2018 Online Application form - Check CTET Exam Date for Primary / Elementary Class I-VIII - ctet.nic.in. On 04.01.2019 - CTET result has been declared now. On 6 September 2018 CTET correction form for paper I has been released now. Those candidates who have completed bachelor of education to apply for paper 1 and had already applied for paper 2 can I apply for correct their application form for Paper I exam. The good news is that Central Board of School Education has released notification and extended the last date for upload photos and signature on official website. These photos and signature can be uploaded up to 2nd September 2018 and the fees payment can be made up to 5th September 2018. According to the updated corrigendum CTET revised notification and allowed B. Ed. candidates to fill for paper 1 class 1st to 5th JBT on condition basis. The application can be corrected from 6 September to 15 September 2018 on official website and the link of correction in application form CTET 2018 will be available on 6 September 2018. Those candidates who had applied for people to and willing to apply for paper 1 can do the same through this link. The exam may be held on 9th December 2018 and the admit card may be available in the last week of November 2018. The candidates are suggested to keep their registration and application print out ready for downloading online admit card. On 01.08.2018 - CTET Sept 2018 Revised Notification Released and Online form available today. All the schedule has been postponed now - The new date will be announced shortly. On 21.07.2018 - CTET Online Form 2018 may be available in the month of August 2018. The new date of online form will be intimated soon. CTET schedule has been postponed now - The new date will be announced shortly. See latest news through link given in the table in the end of the page. The website has been facing technical issue so you can not be able to fill and submit online application form for CTET 2018. The bad news is that the website is under technical problem as it shows the massages repeated same as provided in the below image. The online link for CTET Sept 2018 online application has been activated now. This link is given in the table provided in the end of the page. Note - The candidate should mention their own mobile number and E-Mail id while submitting their on-line application as the CTET alerts will be sent to the candidates on their registered mobile number and E-Mail id only. The exam will be held on 16th September 2018. ID Proof (any of the following) documents such as “PAN Card, Aadhaar Card, Passport, Ration Card, Voter ID Card, Driving Licence etc. Should be done in the Test Booklet only. No rough sheet will be provided at the time of examination. The answer keys will be released within a week after the exam. Candidates can also seek a photocopy of their OMR Sheet of CTET by paying fee of Rs.500/- per OMR, by way of Demand Draft in favour of Secretary, Central Board of Secondary Education drawn on any Nationalized Bank and payable at Delhi. Apply to schools of the Central Government (KVS, NVS, Central Tibetan Schools, etc.) and schools under the administrative control of UT’s of Chandigarh, Dadra & Nagar Haveli, Daman & Diu and Andaman & Nicobar Islands, Lakshadweep and NCT of Delhi. Seven years from the date of declaration of its result for all categories. Eligibility Certificate will be sent to all the candidates securing 60% above marks by Speed Post. The CTET Marks Statement will be sent to the candidates by Ordinary Post. Three options will be provided. The candidates are advised NOT to send the hard copy of the application/confirmation page to CBSE/CTET . Based on the news, CTET apply online link will be available on 22.06.2018 at www.ctet.nic.in. Earlier it was asked to be available on 18th June 2018, but it got delayed due to some administrative reason. Now, the latest information is that CTET Apply Online link will be activated on 22.06.2018. The good news is that CTET Updated notification has been released now. The new exam pattern has been released. The online link will be activated on 18th June 2018. The good news is that CBSE has uploaded 11th CTET 2018 schedule on official website in which start date, last date and payment date along with exam dates are discussed. The written test will be conducted online in 96 cities. The final schedule will be displayed on 12th June 2018 on official website. CBSE is ready to upload notification in which it is clarified that Online application for CTET July 2018 may be invited from 16.03.2018 to 07.04.2018 on official website www.ctet.nic.in. According to the sources, the exam may be held tentatively on 14.05.2018. So get ready and prepare for the exam. The information related to eligibility, age limit, validity, exam syllabus & pattern etc. has been discussed here. 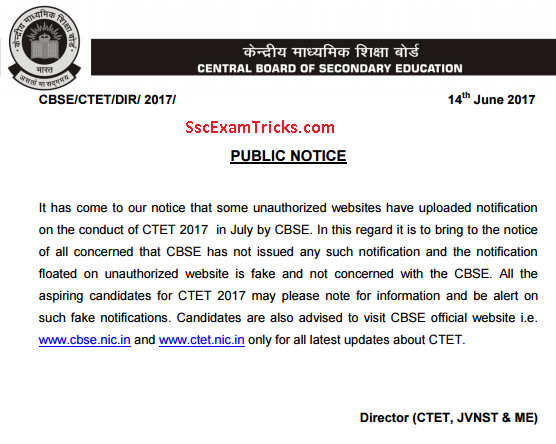 CBSE has uploaded the latest notice in which it is clarified that CTET has not been released till now. Some website shows the date and time for notification but it is still to be available on the official website. Read the notice in the below image. Latest News (21.05.2017) - Notification will take time to upload (3-5 days) and online applications will be available on 02nd July 2017. The Central Teachers Eligibility Test (CTET) has released a notification / advertisement on 14.05.2018 on the official website www.ctet.nic.in for eligibility test for JBT/ PRT, TGT and PGT. You are advised to verify eligibility detailed, how to apply online for registration, age limit and relaxation, application fee, mode of payment of the application fee, how to upload photo & signature etc. from the official advertisement/ notification for CTET JULY 2018. It is compulsory for the candidates to pay examination fee. Candidates will not be given admit card for without confirmation of CTET application form fees. The category wise application fee for CTET JULY 2018 is given below. The process requires registration number and date of birth of candidates to download CTET July 2018 Admit card from the official page on ctet.nic.in. Click the direct link available on this page and enter your registration number as given in application form. Select your DOB from drop down list as DD/ MM/ YYYY. Click on the submit button provided in blue color on the page. In case of no result, click on the reset button given in red color beside submit button. 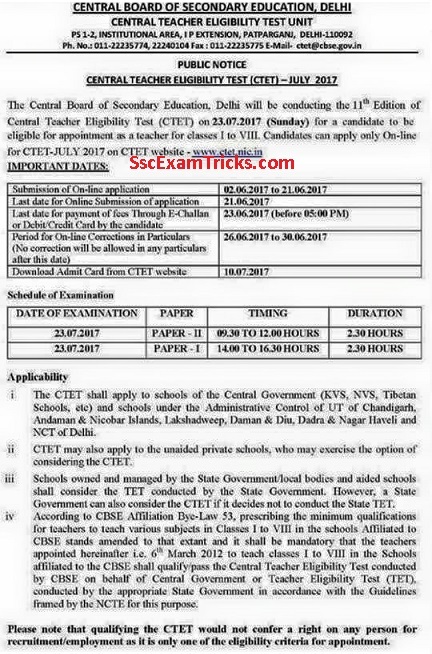 The CTET 2018 will contain name, roll number, registration number with date, time and venue of CTET examination. It will also contain certain instruction to the candidates which will need to be followed in the examination. The admit card will be valid with identity proof authorized by the agency and have coloured photographer of the candidates. 1. Click on the direct link available as ‘Apply Online’ on this page. 2. Select the choice as Primary Teacher (PRT) or Trained Graduate Teacher (TGT) from the drop down menu. 3. The online application form will be displayed on the screen. Fill the particular such as name, father name, address, date of birth, educational DMC marks. 4. Submit the online application form duly filled by the candidates by online mode. 5. Select the mode of payment as eChallan or Online. 6. Make the payment in the account of Syndicate Bank or HDFC bank. 7. Note down the registration number/ application ID and password for future reference. 8. Take the printout of successfully application form of CTET July 2018 on neat and clean paper. CTET 2018 Notification, Admit Card CTET TGT PRT Hall Ticket - CTET SEPT 2015 Notification – Download CTET Sept 2015 Online Application form - Check CTET Exam Date for Primary / Elementary Class I-VIII - ctet.nic.in. 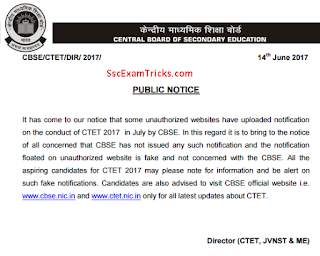 CTET 2017 Predictions - The submission of online application form for CTET JULY 2017 will be made from 02.06.2017 to 21.06.2017 on the official website. The last date for the payment of online application fee through e-Challan or Debit/ Credit card for registered candidates will be 23.06.2017 up to 05:00 PM. The registered candidates can make online corrections in the application from 26.06.2017 to 30.06.2017. Candidates must remember that no corrections will be allowed in the online application form after last date 30.06.2017. CTET 2015: The Central Teachers Eligibility Test (CTET) has released a notification / advertisement on 28.07.2015 on the official website www.ctet.nic.in for eligibility test for JBT/ PRT, TGT and PGT. The submission of online application form for CTET SEPT 2015 will be made from 30.07.2015 to 19.08.2015 on the official website. The last date for the payment of online application fee through e-Challan or Debit/ Credit card for registered candidates will be 20.08.2015 up to 03:30 PM. The registered candidates can make online corrections in the application from 21.08.2015 to 25.08.2015. Candidates must remember that no corrections will be allowed in the online application form after last date 25.08.2015. 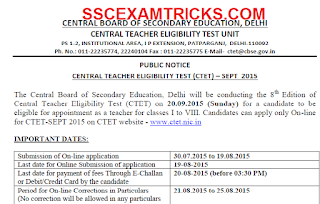 Importance of CTET July 2015 for JBT/ PRT, TGT & PGT Teachers Recruitment Process:CTET is a mandatory requirement for filling the application form for Guest Teacher, Contract Teacher and Regular Recruitment of Teacher in Delhi state. The performance of CTET will be considered in preparing the merit list for JBT/ PRT, TGT and PGT in Delhi Recruitment Process. The final merit list for JBT/ PRT, TGT & PGT Teacher selection in KVS, NVS, Tibetan Schools, etc. will be prepared on the basis of academic performance and CTET marks of the candidates. 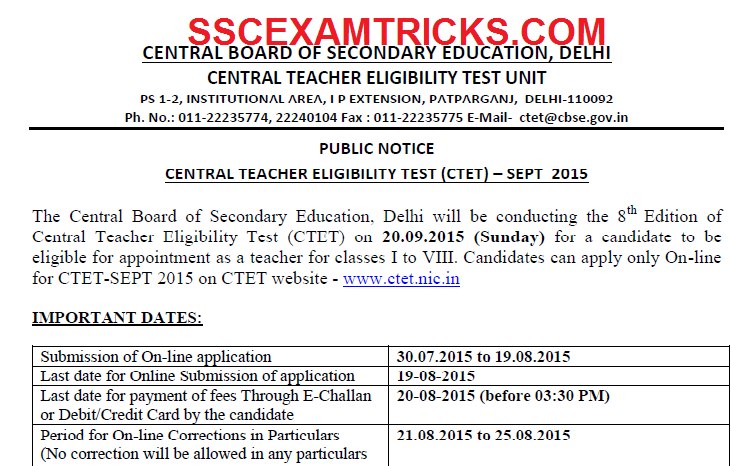 CTET SEPT 2015 will be held for a candidate to be eligible for appointment as a teacher for classes I to VIII. CTET will be conducted on 20.09.2015 (Sunday) for paper 1 and paper 2. The paper 1 will be held in morning shift from 09.30 am to 12.00 noon and paper 2 will be conducted in evening shift from 02:00 pm to 04:30 pm. Both the papers of CTET SEPT 2015 will be conducted for 2 hours. It is the latest news that candidates have started preparing for short cut tricks to achieve cut off marks in CTET Sept 2015 from various coaching institutes. 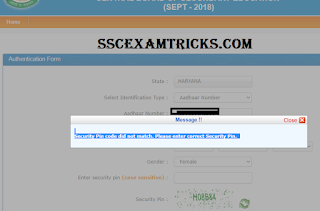 You can get regular updates / latest news about CTET relevant Guest Teacher/ Contract Teacher/ SSA Teacher latest jobs, admit cards, results, scorecard, counseling schedule and document verification of the candidates visit regularly on sscexamtrick.com. Furthermore readers can download tips-tricks & General Awareness questions answers sets for CTET 2015 prepared from most popular books to the candidates to achieve cut off marks for CTET 2015.